Abdul Rahman Sheikh is a 55-year-old mechanic and blacksmith. He would often spend several hours cutting iron sheets and grills in his workshop named “Shahbaaz Steel Hard Works”. The process was tedious and time-consuming. It also lacked in quality due to extensive manual efforts. As the demand for his products increased, things became even more difficult for him. Lack of availability of labour only added to his woes. He was unable to take more orders to expand his business. The situation of not being able to optimize his time filled him with frustration. But all this is a thing of the past now for this Anantnag, Jammu & Kashmir-based businessman. Abdul has come up with an interesting innovation, Improved Iron Cutter. The innovation has not just simplified the process of cutting iron, but has also increased his productivity several times. Son of a bricklayer, Abdul had studied just till grade eight. He discontinued his studies to support his family financially. Yet, lack of educational qualification was never an excuse for this creative mind. Even as a child, he loved experimenting and would often indulge in making of toys made from iron and tin. He was so good at his art that even the then Chief Minister of J&K got impressed after seeing the toys made by him. The CM also gave him an opportunity to undergo any technical training of his desire. He then trained as a plumber for a year and later opened his own workshop. He started making grill gates, iron structures for the household use at his workshop. He also provided repairing services there. And, he learned all this through sheer hard work and dedication without any external guidance. “I acquired a small loan to start my own workshop and hired my brother and two sons to accompany me in the business. I started it as a small business, never expecting it to turn huge,” recalls Abdul. But the quality of his work was so amazing that the demand for his products increased and thus did his workload. It became difficult for the small team to meet the rising demand manually. 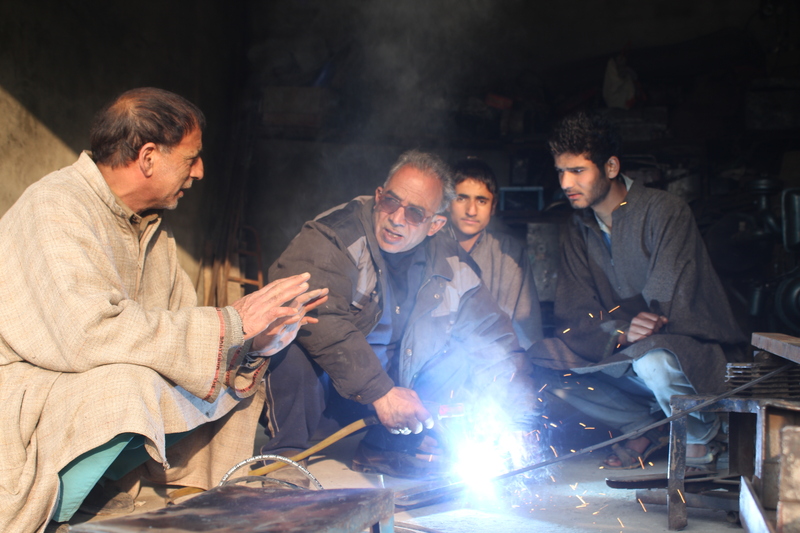 Abdul (center) at his workshop. This is when Abdul thought to innovate a machine to cut the iron sheets in a better and more effective way. And soon, after much hard work, Improved Iron Cutter came into the picture. This useful innovation can cut iron pipes, rods, sheets, etc. multi-directionally. It is capable of not just cutting iron from different angles, but can also cut flat sheets of any length. This iron cutter is similar to angle cutting bandsaw machine. Hacksaw has been replaced by toothed cutter. It can rotate about its vertical axis, which is perpendicular to the plane of the ground. The cutter performs four types of motions. It can move forward and backward, up and down, right and left, and for cutting at an angle the cutter can be rotated on its vertical axis. The cutting range varies from one inch to eight inches. This improved cutter is different from the ones existing in the marketplace since it can cut iron at any angle from 0 to 180 degrees. The other conventional cutters can cut only from 0 to 45, 0 to 60 and 0 to 90 degree. The machine requires just one person to operate it, which makes it convenient for a small enterprise with less labour. Thanks to this innovation, Abdul, who earlier could cut only four to five iron pipes in a day can now cut about 30 pipes. The machine, which runs on electricity, can cut about 20 feet long iron sheet in just 90 minutes. “When I designed this machine, there was no similar product in the market. It wasn’t easy since I was not financially strong to make a machine like this, but my family was immensely supportive. 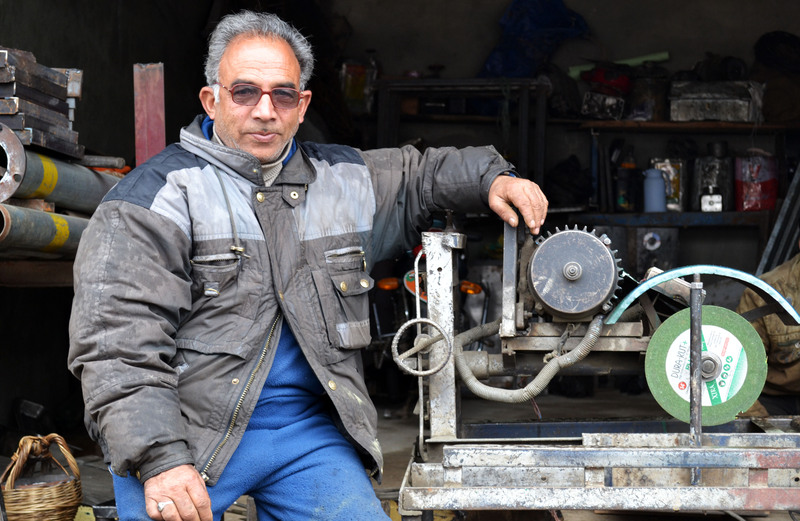 They compromised even on basic things so that I could develop this machine,” says Abdul. His hard work received much-needed support and recognition when National Innovation Foundation identified him. The NIF team has filed an application to register a patent under his name. The team has also engaged a designer to improve the design of the machine to make it more appealing and useful. He received a state award at the 6th National Grassroots Innovation Awards in 2012. “I never did any course to learn my work. I learned everything with passion, interest and hard work. I believe even our education system should promote innovative ideas since childhood. Such innovations and original ideas can make people financially strong, even if they lack proper academic qualifications,” says Abdul.